Mary Poppins author P. L Travers lived in the fashionable district of Bloomsbury when she first moved to London in her twenties. She later made her home in Chelsea, another affluent part of the city. Her book Mary Poppins was published in 1934, and Travers then went on to write eight books over fifty years. The grand buildings, large houses, leafy parks and historic landmarks of the areas of London where the author lived and worked form the backdrop to the movies which are based on her books: Mary Poppins and Mary Poppins Returns. You can visit the places in the city which feature in the films – if you know where to look. In the original 1964 Mary Poppins movie, which is set in Edwardian London, magical nanny Mary Poppins (played by Julie Andrews) arrives at the home of the dysfunctional Banks family. Mrs Banks is a suffragette and her focus is on finding people to look after her children so that she can go out campaigning. Mr George Banks is a hard-working banker in the City and is very serious. Through fantastical adventures with Mary and her cockney friend Bert, the Banks children, Jane and Michael, become closer to their parents. Mary Poppins was filmed at Walt Disney Studios in California, using painted backdrops, but many scenes were set in London locations, such as St. Paul’s Cathedral and the Bank of England. The 2018 movie Mary Poppins Returns is set 24 years after Mary Poppins, at a time of financial crisis. Michael Banks has three young children and is working at the same bank that his father once did. Michael and his children are living in the family home where he grew up, and are having a difficult time, despite the support of Michael’s sister Jane. Mary Poppins (played by Emily Blunt) appears and magical adventures ensue, often involving Bert’s former apprentice, a lamplighter called Jack. Mary Poppins Returns was filmed at Shepperton and Pinewood Studios, just outside London, but it also includes shots and extended sequences in real locations in the city, such as St. Paul’s Cathedral, the Bank of England and Buckingham Palace. 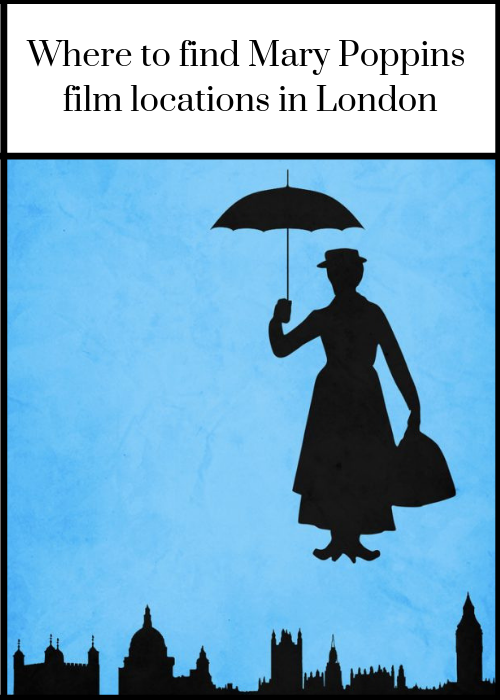 Where was Mary Poppins filmed in London? If you’d like to explore the places in London which inspired and feature in the Mary Poppins films, this is where you need to go. Where did P. L. Travers live in London? A good place to start is at the author’s home. P. L. Travers lived and worked at 50, Smith Street, Chelsea, from 1946 to 1962. The house has an English Heritage blue plaque in her honour – you can see it on the outside wall. Where is Cherry Tree Lane? In the Mary Poppins books and films, the Banks family home is at number 17 Cherry Tree Lane. There is no Cherry Tree Lane in central London, but there are plenty of streets of Georgian houses which look like the Banks’ – particularly in the affluent areas of Chelsea and Kensington. Mr George Banks and, later, Michael Banks work at the fictional Dawes, Tomes, Mousely, Grubbs Fidelity Fiduciary Bank in the City. The Bank of England and Threadneedle Street in the City of London were used as locations for scenes outside the bank in Mary Poppins Returns. If you’d like to go inside the bank, you can visit the Bank of England Museum for free, and learn about its history since its foundation in 1694. There’s a leafy park across the road from the Banks family home, and the children go there to play and have adventures, with and without Mary Poppins. It’s not known exactly which park the author had in mind when she created the stories, but London is blessed with many delightful green spaces, so wherever you are in the city you won’t be far from one. Some of the most popular are Regents Park, which was designed by John Nash and is home to London Zoo, Kensington Gardens, which surrounds Kensington Palace and includes the marvellous Diana Princess of Wales Memorial playground, and airy Hampstead Heath, which has some of the best views and highest points in London – ideal for flying a kite! Mary Poppins Returns includes a night scene in front of Buckingham Palace, the official London residence of Queen Elizabeth II. In the film, Mary Poppins shares a bike with Jack, and they ride past the palace and through a foggy London. You can walk up to the front gates of the palace for free. If you go, try to time your visit to coincide with the Changing of the Guard ceremony, which usually takes place in front of the palace at 11am each day (but it’s best to check to be sure, as sometimes the time changes). At certain times of the year you can also visit the magnificent State Rooms at the palace, for a charge. 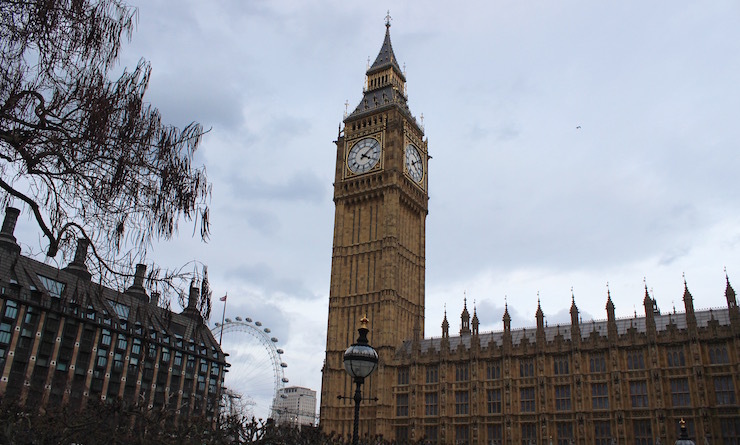 Big Ben, the clock tower at the Houses of Parliament, whose official name is the Elizabeth Tower (Big Ben is in fact the name of the bell inside the tower) plays an important role at the end of Mary Poppins Returns. Apparently a fake tower was built for filming, but footage of the real thing appears in the film. You can see Big Ben from outside the Houses of Parliament, or from across the river on the South Bank. Currently Big Ben and the Elizabeth Tower are being refurbished, so it’s not possible to visit them. Tours are scheduled to resume in 2021, once the work is complete. The famous Feed the Birds song in Mary Poppins features an old womansitting on the steps of St Paul’s Cathedral. The song highlights the importance of kindness and charity. 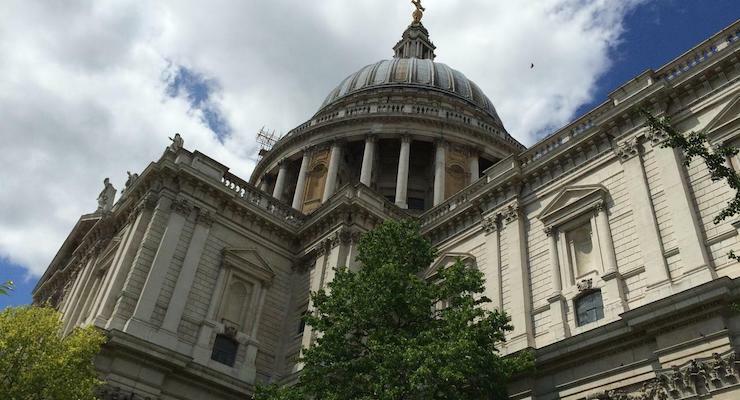 This scene was shot on a film set, but you can visit St Paul’s and see the spot featured. The cathedral also features in Mary Poppins Returns. It’s free to sit on the steps and sing the song! You can buy a ticket to go inside the famous domed cathedral – a highlight is the walkway around the inside of the dome. 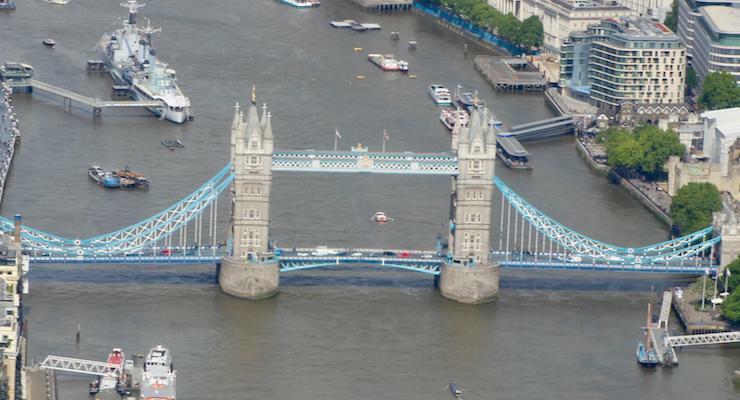 Tower Bridge features in the opening scene of Mary Poppins Returns. You can visit the historic bridge and walk across it for free. You need a ticket to go inside – the interactive Tower Bridge Exhibition is excellent, and offers views from the bridge’s upper walkway, including through its sections of glass floor. Admiral Boom’s eccentric house appears in both films. The Admiral is the Banks’ neighbour, and his house boasts a ship’s deck on the roof, complete with cannons. In Admiral’s Walk, Hampstead, there’s an actual house with a ship’s deck on the roof. It’s called Admiral’s House, and it’s said that it inspired P L Travers. Mary Poppins Returns features a precious Royal Doulton bowl which is kept in the children’s bedroom. To see some Royal Doulton china, go to the excellent V&A museum, which is home to one of the most comprehensive collections of ceramics in the world, including some Royal Doulton pieces. Entry to the V&A is free. 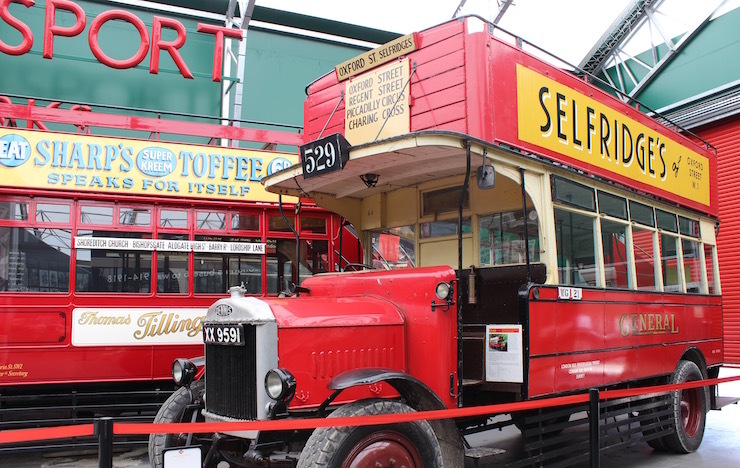 If you’d like to see some vintage London buses, one of which was apparently used in Mary Poppins Returns, head to The London Bus Museum which is home to the world’s largest collection of working historic London buses. The museum shares a site with Brooklands Museum, in Surrey, just outside London. Brooklands is home to an eclectic and astonishing range of historic vehicles, including a Concorde plane and Chitty Chitty Bang Bang (the car from the film of that name). If you’d like a sightseeing pass for your trip to the city, The London Pass could save you money. 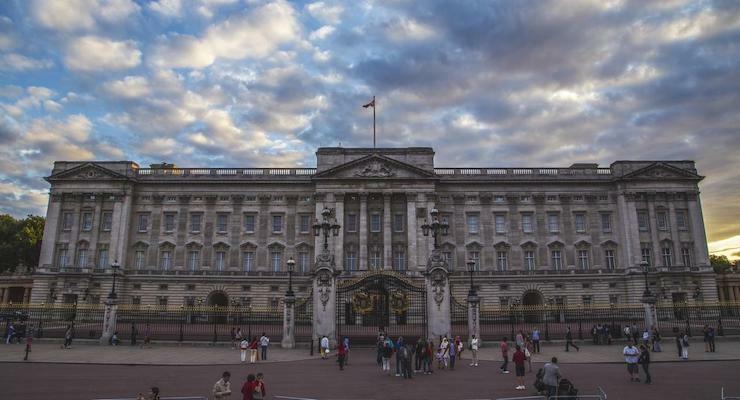 It includes a one-day hop-on hop-off bus tour, as well as free entry to more than 80 attractions, tours and museums, such as the Tower of London, Westminster Abbey and The View from The Shard. The pass also gives you fast-track entry at some of the most popular attractions, so you don’t have to spend time queueing. Each month I publish a round-up of great things to do in London, so do pop back to see it, or you can subscribe to my blog (by entering your email address in the box on the right, where it says ‘YOU’D LIKE MY POSTS BY EMAIL?’) and new posts will be sent to you automatically. Have you been to any Mary Poppins places which I haven’t mentioned? Do let me know if I’ve missed anywhere!